What's New in the 5th Edition of College and Career Success? 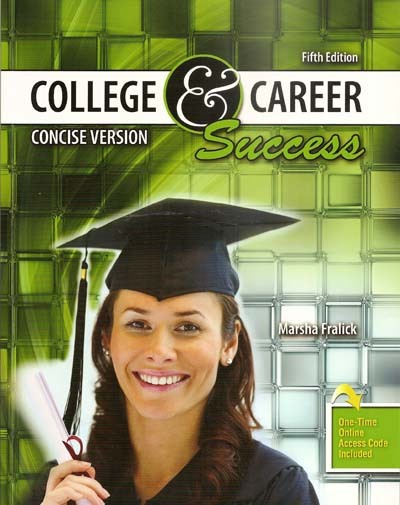 For a complimentary copy of the Concise Edition of College and Career Success fill out this online request form. The Journal Entries provide a way for students to make personal connections to the material and to apply the concepts learned in the text. They are integrated into the CollegeScope e-text and become part of the Student Portfolio. These Journal Entries are included in the printed text, College and Career Success, with Word documents posted at this site for student convenience. Topics include the value of a college education, how to choose a major, how to be motivated, developing habits that lead to success and the value of persistence. Topics include choosing a major that matches your personal strengths; understanding personality types; personality and preferred work environment, decision making, time management and money management; career outlook and finding your passion. The Do What You Are personality assessment is included. Topics include understanding learning style, learning strategies, how personality type affects learning style, understanding your professor's teaching style, and multiple intelligences. The Productivity Environmental Preference Survey which measures learning style and productivity and suggests matching learning strategies is included. Topics include exploring your vocational interests, using values to make important life decisions and acting on your values. The Interest Profiler which measures vocational interests is included. Topics include employment trends, work skills for the 21st Century, career research, educational planning, making good decisions, the resume, interview skills and finding success in adversity. Topics include improving memory, improving study techniques, mnemonics and other memory tricks, optimizing your brain power and applying memory techniques to reading improvement. Topics include taking notes on the college lecture, note taking systems, improving note taking efficiency, reviewing your notes, power writing, and basics of public speaking. Topics include test preparation, dealing with test anxiety, studying for math tests, tips for taking tests, and how to be prepared. Topics include fallacies in reasoning, how to become a critical thinker, moral reasoning and creative thinking techniques. Topics includes longevity, nutrition, exercise, avoiding addictions, avoiding sexually transmitted infections, getting enough sleep and making positive changes in your life. The Concise Edition is designed for 1-2 unit courses or developmental courses in which students need more time for practicing the materials. The career focus has been maintained with the inclusion of the chapter on personality types and careers. The Do What You Are personality assessment is included. The focus on learning style and productivity has been maintained with the inclusion of the chapter on learning style and intelligence. The PEPS learning style and productivity assessment has been included. College success is the central theme. The language is appropriate for developmental students. There are only 8 chapters in the Concise Edition as compared to 14 chapters in the complete edition. See the chapter titles and brief contents below. Topics include the value of an education, how to choose a major, how to be motivated, health factors related to college success and being persistent. Topics include choosing a major that matches your personal gifts and talents; understanding your personality type; personality and preferred work environment, decision-making, communication, time management and money management; and career outlook. Topics include understanding learning style, learning strategies, how personality type affects learning style, understanding your professor's teaching style, and multiple intelligences. Topics include lifetime goals, using priorities, estimating study and work time, schedules, time management tricks, dealing with procrastination, and money management. Topics include optimism, hope, future-mindedness, using affirmations, successful beliefs, using positive words, finding opportunity in adversity, using personal values to make decisions and secrets to happiness.